Last year, I blogged about the drawer system I use for organizing my music games. It so important to be able to easily find the needed teaching materials during lessons! Since moving last summer, I ended up updating my drawer categories somewhat. This drawer unit is from IKEA, by the way. Props/Improv — Japanese puzzle erasers, various props for teaching hand shape, Rory’s Story Cubes, Flashcards for Composition/Improvisation, etc. Rhythm — rhythm cards, Rhythm Train Game, Rhythmic Value Cards, etc. Alphabet — this includes piano key identification cards, Scrabble tiles (A-G only), alphabet spinners, alphabet dice, etc. Notes — musical alphabet word cards, note-naming flashcards, etc. Intervals — Ice Cream Interval game, interval cards, etc. Keys — key signature flashcards/dice, key props and printables, and anything related to chords. In another room, I keep a few drawers of games that only work for groups of students. I pull those games out when I hold my Piano Parties (monthly group classes). After attending Irina Gorin’s 2015 workshop in Fishers, Indiana, I was inspired to create a series of free printables relating to her ideas and teaching approach. Here they are! On p. 20 of Irina’s method, Tales of a Musical Journey, there is a neat activity where the student learns to play the “EIEIO” part from the familiar Old McDonald tune by rote, using the three black keys and finger three. Irina usually improvises the rest of the song on the piano or uses the accompanying CD track. I decided to write out the teacher duet part and share it here, in case you, like me, prefer having the sheet music on hand as a reference! The next printable is a set of poetry cards. Irina likes to use short, easy poetry to teach students to speak clearly and expressively with words — a skill they will later use with music. My thought was that it would be convenient to print these little poems as a set of cards for use both at home and during the lesson. I have just finished updating one of the studio business forms from the Printables page for the 2015-16 school year. It is called the Record of Lesson Attendance & Payment pdf. I do not currently use this form myself anymore, but I have received quite a few requests from teachers who used it last year so I was happy to update it again this year! In case you haven’t seen this, here is how the form works: Write your students’ names in the first column. Each week, write the lesson date (in a month / date format) in the column for that week. This is how you can track attendance. The small circles in each cell are where you can write checkmarks indicating tuition payments. Whether you charge by-the-week or by-the-month, you can place a checkmark by each paid lesson date. Download it here or on the Printables > Studio Business page. P.S. : Here is a link to where I explain my current system for tracking payments received. 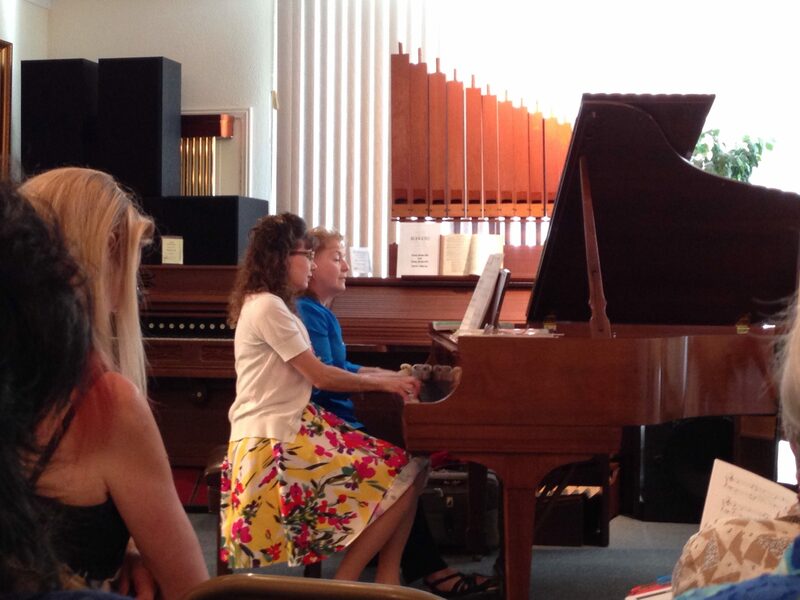 Last week, I attended a three-day workshop given by Irina Gorin in Fishers, Indiana (outside of Indianapolis) for her self-published piano method, Tales of a Musical Journey. If you aren’t already familiar with Irina’s work, you can read a bit about her in this written interview I conducted with her back in 2011. I’ve been an enthusiastic follower of Irina’s YouTube channel for a few years now and have learned so much from her teaching videos. I highly recommend subscribing to her channel. When I heard that Irina was going to offer this workshop for the first time, I knew I had to try to attend because it is so rare to have the opportunity to learn about teaching beginner piano students and I am a huge fan of Irina’s teaching approach. Most conferences and workshops tend to focus on intermediate or advanced students. I am SO glad I went, because I learned so much that I can apply to every lesson that I teach in the future. And I will definitely be using her books with more of my beginners in the future! Irina’s piano method, Tales of a Musical Journey, is different from mainstream piano methods in many ways. I have experimented with her books only a little bit over the past year, but I am intrigued and I can see that Irina is really onto something with her approach. Irina’s books are an attempt to combine the best pedagogy from Russian piano methods and American piano methods. The Russian Piano School is much older than the American and there are definitely many time-tested principles that we American teachers can learn from. Irina was kind enough to connect me with another piano teacher from Ohio who I could carpool and room with. 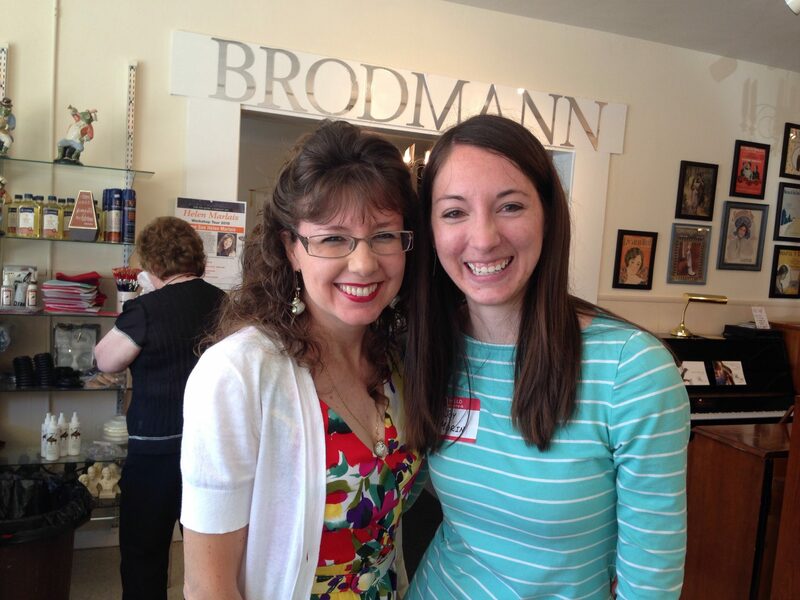 Tamara and I become good friends during the workshop! For some reason, my blog post of notes for final Day 4 of the 2015 NCKP did not come through for email subscribers yesterday, so I’m posting this little note to let you know that I did indeed publish it and you can read it by clicking here. :) Hope you are having a wonderful week! 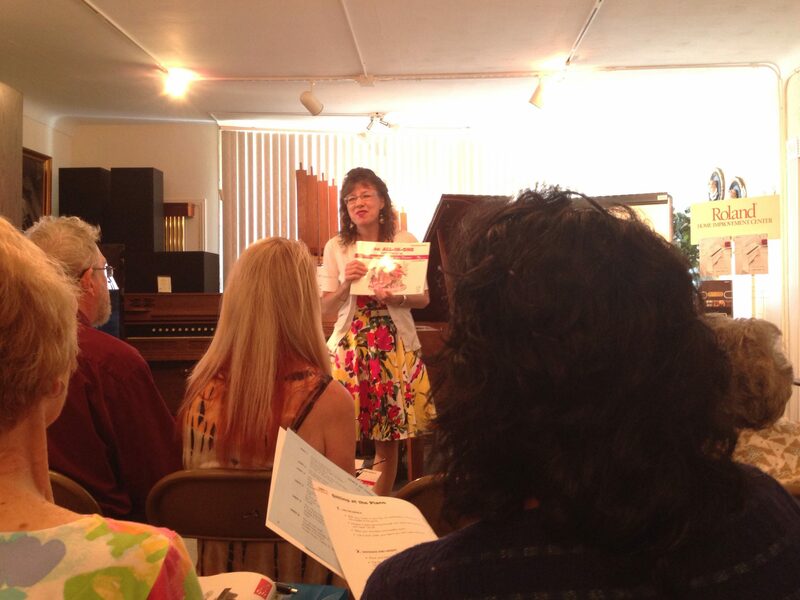 There was a free piano teacher workshop with Helen Marlais at my local music store yesterday. 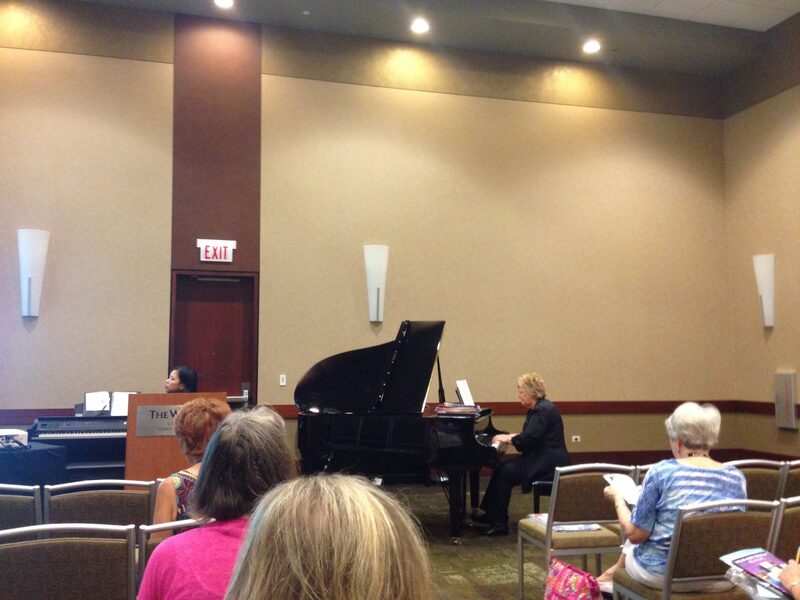 She talked about FJH Publishing’s new All-In-One version of the Succeeding at the Piano method, among other things. Fun! Helen grew up here in the Toledo area. Here, she plays a duet with her childhood piano teacher! 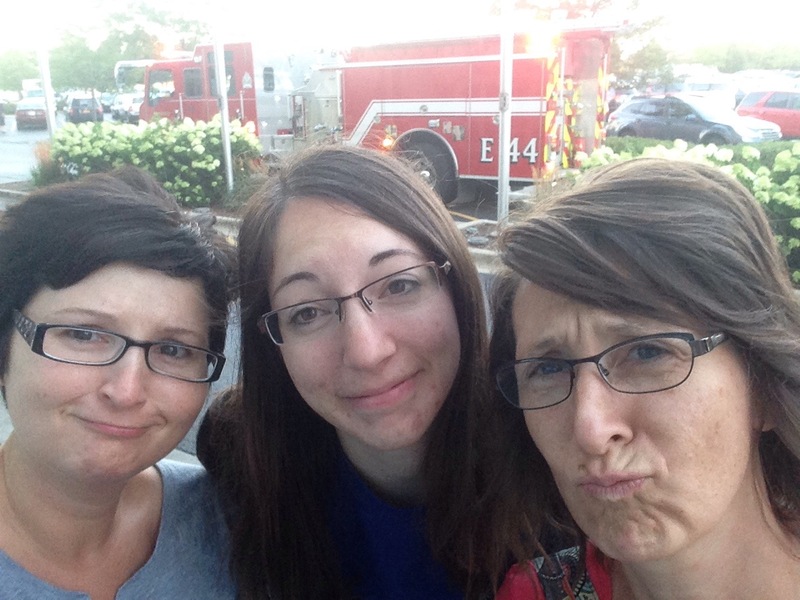 Helen currently lives in Grand Rapids, Michigan…which is where I grew up. Such a small world! In other news, a fancy new Office Depot discount card arrived in the mail yesterday. As far as I can tell, these cards are automatically being sent out to all MTNA members. The back of the card specifies a discount on printing and copying costs. Thanks, MTNA! In continuation of my summaries of the happenings at the 2015 National Conference on Keyboard Pedagogy, below are my notes from Friday, July 31. The Willis Music publisher showcase, called Recital Repertoire for Rave Reviews, was led by Carolyn Miller. She played a huge variety of music, including many recent publications, that would be particularly effective performed at recitals. 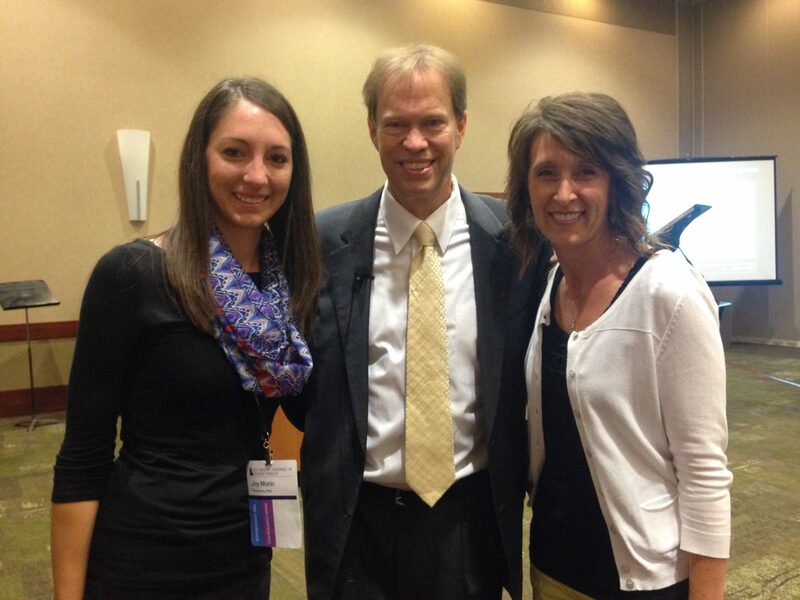 We also ducked into the Faber Piano Adventures showcase and took a picture with Randall Faber afterwards! 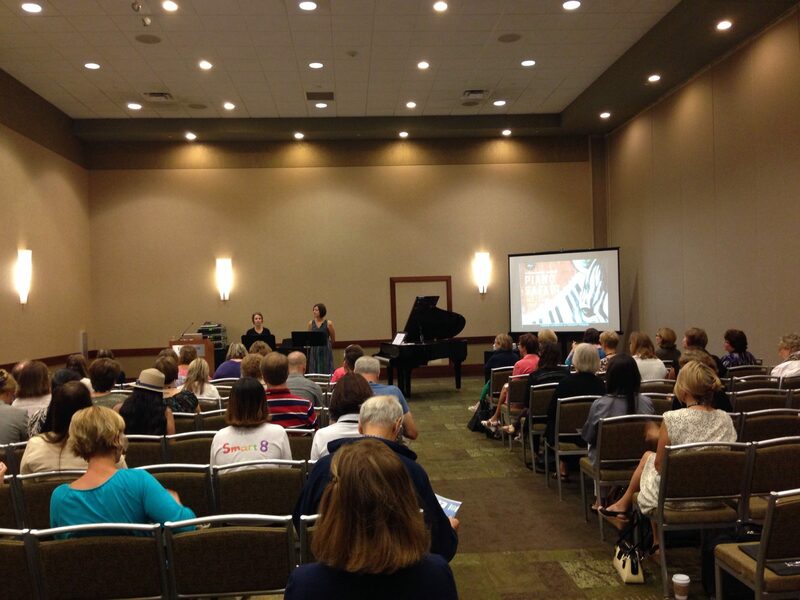 For the first morning session, I attended the publisher showcase for the Piano Safari piano method, which is authored by Katherine Fisher and Julie Knerr. Piano Safari is a piano method for ages 5-11, but it has been used successfully with 4-year-olds. It uses an intervalic reading approach and uses both “reading pieces” and “rote pieces” to create strong readers in students. In their session, Julie and Katie walked us through Level 1 of Piano Safari, demonstrating the pieces and discussing the logic and pedagogy behind their piano method. It was a fun and informative session. I’ve blogged about Piano Safari before, but in case you haven’t heard of it, you can learn more about it and order it through their website: PianoSafari.com. There are a variety of pedagogical essays available for free download there, as well as new pieces of solo sheet music available for order.